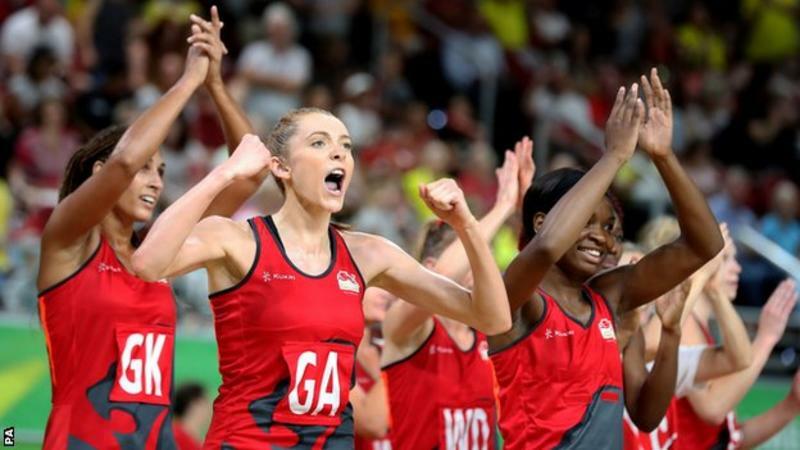 bbc.comEngland are through to the semi-finals of the netball at the Commonwealth Games - but this time it's different. The world number three side have reached the semi-final stage at every Games since the sport was introduced in 1998.But, for the first time, they won't be facing Australia or New Zealand in the last four. England defender Geva Mentor is playing at her fifth Commonwealth GamesEngland defender Geva Mentor is the best goal-keeper in the world and even the Australians would agree.The 33-year-old, who was born in Bournemouth, is now a dual Australian citizen and a superstar down under.She was one of the first English players to move to Australia back in 2008 and was left out of the England team for 18 months following that decision.But 2017 was a stellar year for Mentor on both the domestic and international stage.She was crowned 'Super Netball player of the year' after captaining Sunshine Coast Lightning to Australia's domestic league title, before helping England to victory in the Fast5 World Series.And Mentor, a veteran of five Commonwealth Games, has been combining her bid for a Commonwealth gold medal with continuing her studies[/i]. bbc.comEngland centre Serena 'Bob' Guthrie is another English player who benefitted from Mentor's pioneering move.The 28-year-old, a DJ in her spare time, lost to Mentor with Sydney side Giants in the Super Netball final but the two players are the driving force behind England's success.Guthrie - one of the fittest and most aggressive players in the world - was dramatically carried off the court in England's first game, leading to fears their gold medal bid was over.But she recovered to dominate the pool stages with her speed, athleticism and fiery on-court nature. England's head coach may not be the most famous member of the Neville family, but she might be the best manager.Opinionated, forthright and a grafter - Tracey Neville is the sister of former England football defenders Phil and Gary and has been at the helm of England netball since 2015.The 41-year-old, whose twin brother Phil became the head coach of the England women's football team in January 2018, deserves plenty of credit for England's recent improvement.She has been helped by England's star players moving to play in Australia - the world's top domestic league - as well as the increasing professionalism of the game. Tracey Neville took permanent charge of England in 2015 having guided them to third place at the World Cup"There's definitely been a seismic shift of power which is fantastic for international netball," said Australia head coach Lisa Alexander before the Games began.England last contested the final of a major tournament in 1975 at the world championships. If they make Sunday's final, Neville thinks they will be 'unbeatable'. Pitman made her England debut against South Africa in January 2017Wing-attack Chelsea Pitman is the only England player to have appeared in a World Cup final, and she came away with a gold medal. How[/IMG]An upset on the cards? Jamaica pulled ahead in the dying minutes in Glasgow 2014 to beat England to bronzeWhile third-ranked England go into Saturday's semi-final against Jamaica unbeaten on the Gold Coast and favourites to progress, there might yet be a sting in the tail.Four years ago in Glasgow, after an agonising one-goal semi-final defeat by New Zealand, England lost the bronze-medal match to Jamaica's Sunshine Girls.And it was the same story in Manchester in 2002, where a side including 17-year-old Mentor and Neville, lost out to Jamaica in front of their home crowd.As well as history, Jamaica have another weapon in their ranks - their captain, and 6ft 6in shooter Jhaniele Fowler-Reid.In Saturday's semi-final, it will fall to Mentor and England captain Ama Agbeze to stop the 28-year-old.Fowler-Reid shot 30 goals from 32 attempts as her side fell to Australia in the group stage - their only defeat of the tournament.At the other end, goal-keeper Shamera Sterling - a recent signing for English side Loughborough Lightning - has also been one of the best players on the Gold Coast. Australia beat New Zealand in the 2014 final in GlasgowAustralia and New Zealand have contested all five Commonwealth Games finals since 1998 - but 2018 marks the end of that dominance.England beat New Zealand in their final pool match to finish as group winners, a victory which could see the Silver Ferns miss out on the final for the first time.Back in New Zealand, calls for head coach Janine Southby to be sacked are intensifying, and the team are said to be fighting to save their credibility. [/i]And reliable shooter Maria Folau, who was already under pressure to keep afloat a sinking side, has endured a doubly difficult week in Australia.Husband Israel Folau, an Australian rugby union player, suggested gay people would end up in hell and received fierce criticism.If the two games go with form on Saturday, it will be England facing defending champions and hosts Australia for the gold medal.